The Air Quality Index in the Bay Area as measured by AirNow. 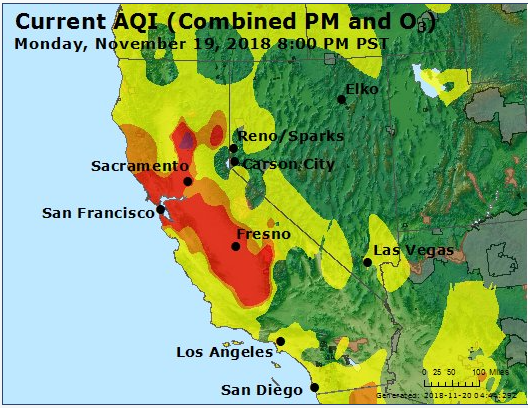 Smoke from the wildfire in Butte County has resulted in dangerous air quality throughout the Bay Area — on Thursday evening, the Air Quality Index in Los Altos measured between 230 and 250 according to AirNow, a service of the EPA. 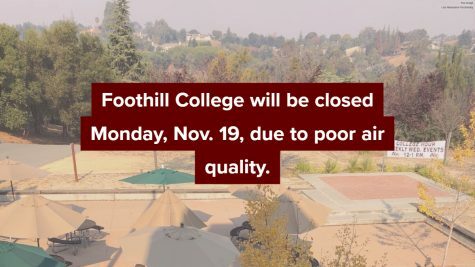 Foothill College, along with universities and school districts statewide, closed its doors until Monday as the AQI rose rapidly. 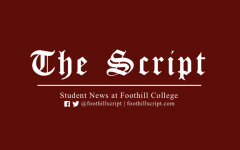 Foothill College is scheduled to reopen on Tuesday. On Twitter, the college cited upcoming rain and an improved AQI as its reasons for resuming regular college schedules on Tuesday. As of Monday evening, the air quality in the Bay Area still measures above 130, which is considered unhealthy. Rain is not forecasted until Wednesday. AirNow discourages prolonged outdoor activity when the AQI hits any number higher than 100. Any number above 200, like Thursday’s AQI, is considered very unhealthy, with serious health effects for everyone. Thursday’s conditions led to the campus closure. 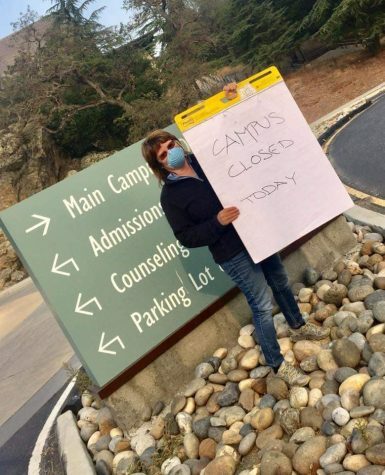 An evacuation notice was sent out by call, text, and email at 8:02 a.m. Thursday, but only reached a portion of the people on campus. 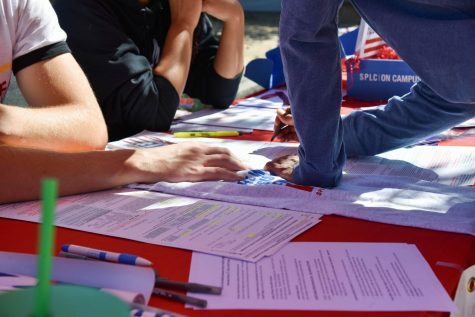 Staff and students with early schedules were already at Foothill — working, teaching, or in class. 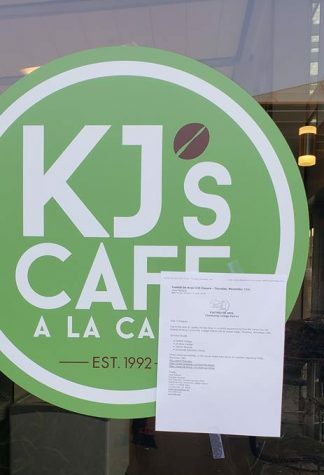 Several employees working at KJ’s Cafe did not receive any emergency alerts about the campus closure and had to be informed to evacuate by their customers. Jared Baker, an employee at the KJ’s Cafe cafeteria location, had been serving students for 30 minutes before the early morning alert. 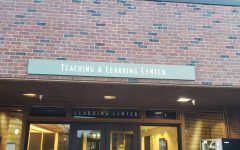 “The company didn’t notify me — the students had to,” Baker said. A notice hangs on the door of a KJs cafe location informing people on the Foothill College campus of the closure. KJ’s Cafe employee Alex Arias arrived on campus at 6 a.m. to begin his usual shift and worked for two hours until he was notified. Prolonged exposure to the smell of the smoke had been making him dizzy, he said. 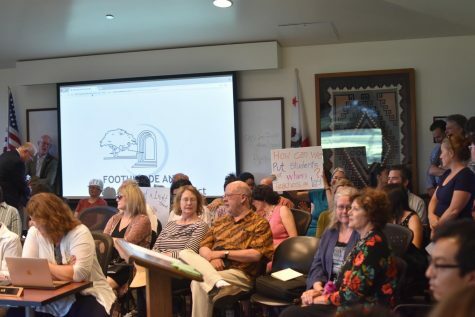 Foothill student Irene Tham, who didn’t receive any notifications on her phone, was busy tutoring when she heard the news from the staff around her. 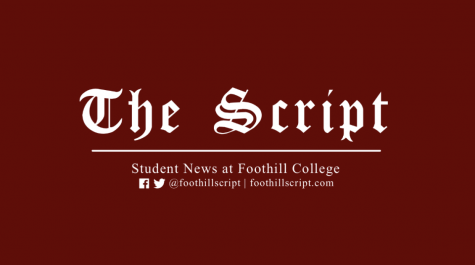 “I was surprised Foothill was canceling classes due to air quality,” she said. Dizziness and irritation are just some of the symptoms produced by exposure to wildfire smoke. Spending any time outdoors when the AQI measures above 200 can result in health complications ranging from scratchy throats to severe respiratory infections like bronchitis and pneumonia. And for people with pre-existing conditions like asthma, the symptoms are exacerbated. After she stepped out into the hallway, Cheng began to “cough like crazy.” She stressed the importance of seeking medical help for reactions like hers. Faculty members were informed only 10 minutes earlier in a districtwide email sent out to employees. Several had already begun teaching when the text alert was sent and needed to cut their classes short. Child development Instructor Maria Dominguez was notified at the same time that students were. 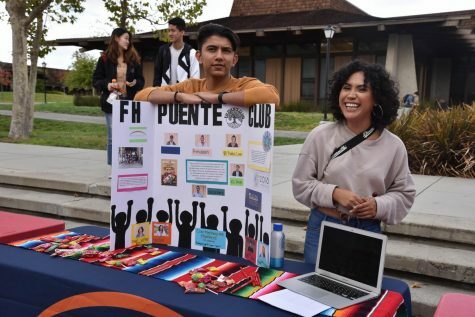 “It was until one of the students came to show me the text that I checked my own phone and email,” Dominguez said. To ensure that everyone had received word of the closure, campus police and administrators escorted people off campus. Bret Watson, vice president of marketing, was one of those responsible for managing the evacuation. Director of Facilities Branda Davis-Visas stands in front of Foothill College alerting incoming cars of the campus closure. On Twitter, President Thuy Nguyen addressed students and employees of the college. 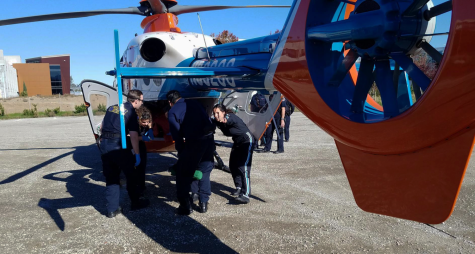 “Health and safety is of the utmost concern to us,” Nguyen said in a Thursday message. 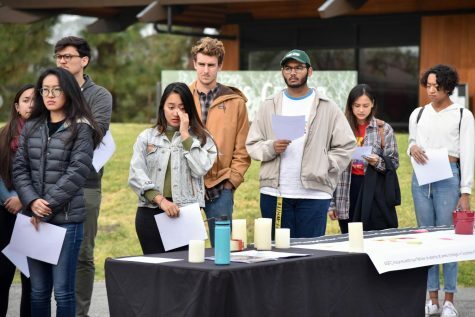 UC Davis, UC Berkeley, Ohlone College, De Anza College, and Foothill all extended their campus closures on Sunday. 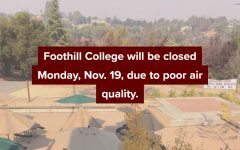 A Foothill-De Anza districtwide alert was sent out Sunday afternoon confirming the colleges will remain closed on Monday. The campuses will reopen on Tuesday.